The perfect gift for anyone with sensitive skin or those who like to keep their skincare pure and simple. We’re always happy to swap a fragrance in this box , just ask! Gorgeous Body Cream Ingredients; Aqua, Cetearyl Alcohol and Polysorbate 60 (emulsifying wax NF), Theobroma Cacao (cocoa butter), Prunus Amygdalus Dulcis (sweet almond oil) Oryza Sativa (rice bran oil), Ricinus Communis (castor oil), Beeswax, Honey, Glycerin, Phenoxyethanol and Caprylyl Glycol (preservative), Triticum Vulgare (Wheat) Germ Oil, Lavandula Augustifolia Oil (lavender essential oil contains naturally occurring Linalool). Silky Hand Cream Ingredients; Aqua, Cetearyl Alcohol and Polysorbate 60 (emulsifying wax NF), Theobroma Cacao (cocoa butter), Prunus Amygdalus Dulcis (sweet almond oil) Oryza Sativa (rice bran oil), Ricinus Communis (castor oil), Beeswax, Honey, Glycerin, Phenoxyethanol and Caprylyl Glycol (preservative), Triticum Vulgare (Wheat) Germ Oil, Lavandula Augustifolia Oil (lavender essential oil contains naturally occurring Linalool). Lip Salve potlet Ingredients; Prunus Amygdalus Dulcis (sweet almond oil) Beeswax, Triticum Vulgare (Wheat) Germ Oil. Hand soap Ingredients; Glycerine, Aqua, Sodium Palmate, Sorbitol, Sodium Cocoate, Ingredients; Glycerine, Aqua, Sodium Palmate, Sorbitol, Sodium Cocoate, Palm Fatty Acid, Coconut Fatty Acid, Pentasodium Pentetate, Tetrasodium Etridonate, Beeswax, Lavandula Augustifolia Oil (lavender essential oil). Bath bomb Ingredients; Sodium Bicarbonate (bicarbonate of soda), Citric Acid Monohydrate, Zea Mays Starch (cornflour), Honey, Lavandula Argustifolia (lavender essential oil). 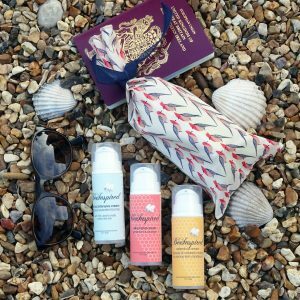 Our favourite selection for a short break and those who like to keep their skincare pure and simple. 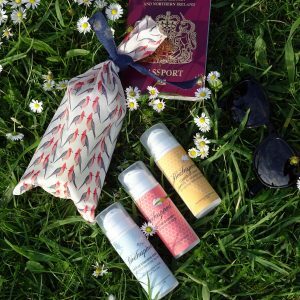 Silky Hand Cream with geranium and orange essential oils – prize winning and gorgeous! We’re always happy to change a fragrance in this selection , just ask! Bee Alert! 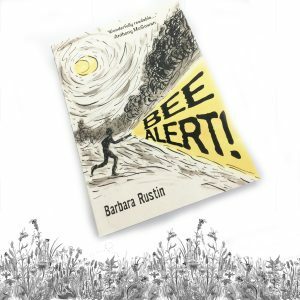 – Barbara Rustin’s first book – was born out of the desire to increase awareness, not only of large-scale bee disappearances but of their causes and implications. Barbara felt that the information should be embedded in an exciting story and that is what she set out to write. Although the book is for children (9 – 11 years), it will, she hopes, amuse and inform adults too. A mystery story, it concerns not only the life of bees and the causes of their current plight but the related threats to other wildlife and even to human health. When Ben goes to stay with his grandpa in the country for the summer, he’s hoping that somewhere, somehow, there’ll be a mystery to solve – a theft, a kidnapping, a murder even . . . When he stumbles on a case of alarming disappearances he comes to realize that solving this mystery may prove more dangerous than anything he could possibly have imagined. Will anyone believe his incredible story? 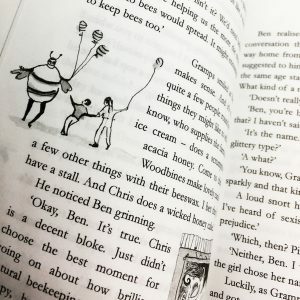 Alison met Barbara just as the book was published, bought a copy for Callum and proceeded to read it – an enjoyable read for all, so we’d like to share it with everyone! GIFT WRAPPING Having spent holidays in Europe, and of course shopping too, we love it when sales assistants ask if the item is a present and then wrap with special paper and ribbon. One year in Denmark we must have spent 20 minutes watching our gifts being beautifully wrapped, and were reminded of Rowan Atkinson in Love Actually spending an age overly wrapping the present – such a funny scene! 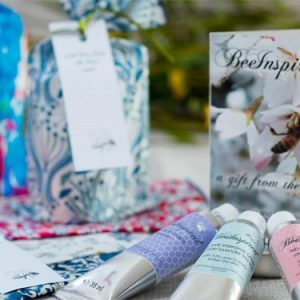 We struggle with gift boxes, often in another box with enormous printed ribbons which really have no use but are too good to throw into the recycling bin. We’ve not compromised but been creative and to date our gift wrapping has proven very popular. 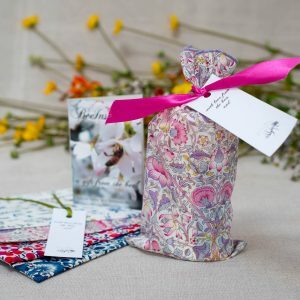 Your choice for gift presentation is a bag made with either Liberty Tana Lawn or recycled linen, tied with a ribbon and a gift tag (we can even custom print these for you as we recently did for a dinner at the House of Commons). We hope the recipient will either use the bag for wrapping a special piece of jewellery, re-use for another present or even use in handbags/tool box/briefcases for keeping something special! The choice of fabric will vary, and we’ll match colour to the product choice, however if you have a colour preference please let us know when ordering! Lip Balm stick – possible the most simple as well as effective one there is! Beeswax Candle (not shown) or we can substitute with a floral moulded beeswax thread conditioner if your recipient is a Sewing Bee fan! The perfect gift , the dynamic combination of geranium and orange essential oils is balancing, uplifting and energising, and does not surprise us that this is one of our most popular combinations. The aroma is a light, fruity and citrus combination. The perfect gift! The harmonising combination of bergamot, sandalwood and pine essential oils is known to be relaxing, restorative and harmonising, as well as having a rich woody aroma.